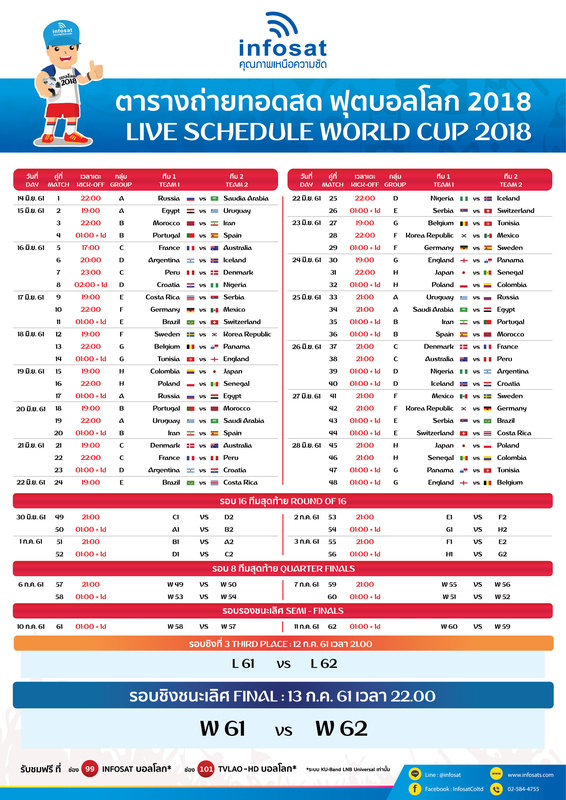 Here is an overview of the broadcasting of the World Cup on English TV (ITV/BBC). It was published in The Independent yesterday. Many good schedules here. But, has anyone got a schedule that includes the broadcasting Thai TV-channel? And (very) preferable, NOT in Thai. There are only three to choose from, but it would be nice to know in advance. Found this from the Nation. KO times are 30 minutes after the start time shown on the charts. The dates for the third place play off and the final are wrong on this schedule. You are right, it should read 14 and 15 July, respectively. Thank you for remarking it.